50 hung around to perform their 2009 Grammy Award-winning track "Crack a Bottle" as well as his greatest hits "I Get Money" and of course, "In Da Club". The rapper brought out Bebe Rexha for "The Monster" which she wrote but was performed by Rihanna in the end. Dre, who discovered Eminem, then took the stage as Eminem rapped the famous lyrics "Dre's dead / he's locked in my basement" from his 2000 song "The Real Slim Shady". 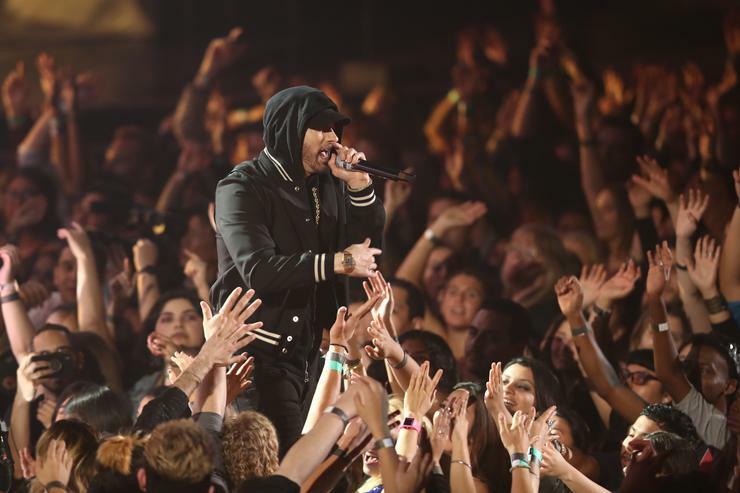 Last night saw Eminem play a stellar hit-packed headline show at Coachella 2018 - featuring the likes of Dr Dre, Skylar Grey, 50 Cent and more. The Aftermath boss and his protege performed their hits "Still Dre", "Medicine Man" and "Forgot About Dre", bringing some nostalgic memories to the audience. Following the show, 42-year-old Fiddy took to Instagram to reflect on their time together on stage. Not only did Coachella attendees/those lucky sons of guns get to see Beyoncé take us to college with Destiny's Child, Jay-Z, Solange in tow, as well as Cardi B twerking, but they experienced headliner Eminem's one-time "Mom's Spaghetti" pop-up, complete with spaghetti, meatballs, sandwiches and more. The main at of Sunday was for sure Eminem performance that, unfortunately, wasn't streamed live.